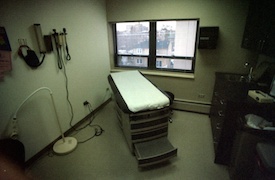 An important part of owning a medical practice is being prepared with the right exam room equipment. Equipping your exam rooms with all of the items you need to assess and treat patients is the best way to ensure you’ll be prepared to provide the highest level of care in your practice. When it comes to choosing your exam room equipment, the American Academy of Family Physicians recommends opting for higher quality versus the cheapest option. Exam tables, for example, vary greatly in comfort and functionality based on how much you spend. Spending a little more now to get something that offers the best patient experience is definitely better than just choosing the cheapest option for your practice. There are some basic pieces of medical equipment that all medical practices should have, including exam tables, diagnostic tools, vital sign trackers and other types of furniture and medical equipment. Leasing exam room equipment makes it easy to get all of the medical equipment you need to sustain a busy, thriving practice. FinancingMED provides assistance in the acquisition of all types of exam room equipment, including exam tables, diagnostic equipment and supplies.